Layered with Jell-O, bananas, and whipped topping, this recipe is super easy to make and one that the whole family will enjoy. A simple salad that will go with any meal. 1 package Jell-O, favorite flavor - small pkg. 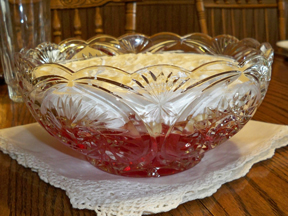 Make Jell-O according to the package directions and pour into the serving bowl. Refrigerate until fairly firm. Cut two bananas into approximately 1/8 inch thick slices. Layer the slices over the top of the Jell-O. You should have at least two layers of bananas. Spread whipped topping over the layer of bananas. 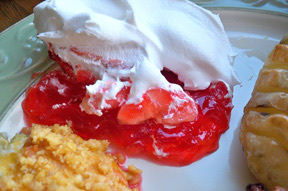 Make the whipped topping layer approximately 1 inch thick or maybe a little less. It should not take a full 8 oz. container of whipped topping. 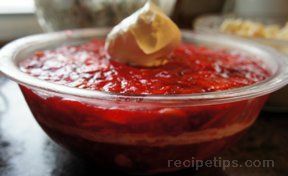 Note: We like to make this with cherry or strawberry Jell-O but you can use any flavor you would like. 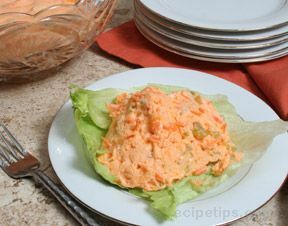 "I needed a simple salad to take to Mom's on Easter. Didn't have a lot of time to make something so I tried this recipe. It was super simple and the little kids loved it on Easter."